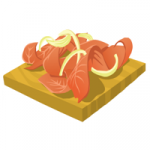 Lotsa Lox is one of the few Glitch dishes that feature Salmon – the only kind of fish available in the game. If you want to make this dish properly, it takes a little time and effort, but is well worth it. Enter your email address to subscribe to the Glitch Cookbook and receive notifications of new posts by email.